For my birthday I received a sampler pack from Koval Distillery in Chicago. The pack consists of three, 200 ml bottles of their three main whiskies, their Bourbon, their Rye and their Four Grain Whiskey. A great birthday present, indeed, and I couldn't wait to crack into these. Although this blog is typically devoted to full bottles that I've finished, allowing me to give each whiskey a full and fair opportunity, these bottles are at least slightly larger than your typical samples. Plus, I'm drinking them anyway, so I figured I might as well take notes and post my thoughts. 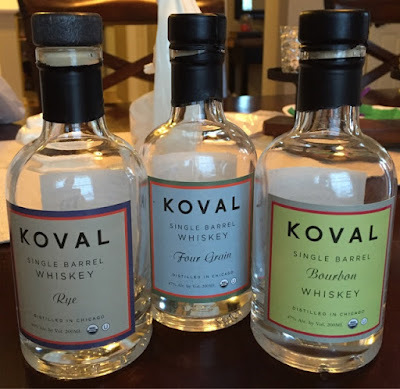 I've reviewed the Four Grain Whiskey previously on this blog, so I'm only reviewing the Koval Bourbon and Koval rye here. However, I will take a brief moment to note that I enjoyed the Four Grain Whiskey more the second time around than the first, perhaps because I knew what to expect out of its unique flavor profile. Still a bit of an odd and acquired taste, but a bit more enjoyable this time. As for the Bourbon and the Rye . . . The nose on this bourbon was very sweet, sugary sweet. It was not the traditional caramel, vanilla or toffee aromas that bourbon usually gives off. It also had an odd, ethanol smell to it that was a bit reminiscent of nail polish. This was very much a foreshadowing of what was to come once I poured a glass. I had a hunch going in, and my fears were confirmed. Though called a bourbon, this did not taste like a bourbon. I've been here before with another small, craft distillery's "bourbon," though this experience was not AS bad as that one. Though this is definitely a whiskey, and it was drinkable, to call itself a bourbon is misleading, at least to the extent that I've come to expect a certain type of flavor profile to exist within every bourbon (even though those flavors can vary greatly from bourbon to bourbon). This was something else. It lacked any notes of vanilla, caramel or even oak that I've come to expect from my bourbons. Rather, I primarily noticed an artificial sweetener type of sweetness, mixed with mild flavors of apple and honey-wheat bread. Needless to say, it was an odd flavor. My second and third pours yielded better results, however. Though it still wasn't bourbon-ish, the more traditional grain flavors began to come through, including a stronger wheat bread flavor, along with some mild baking spices coming through. Although this "bourbon" did not entirely redeem itself, it did show some improvement. I'm not certain, though, that it got to a point where a full bottle might warrant consideration. Needless to say, this sample bottle certainly does not have me running to the store to stock a full bottle. This is a very high-rye rye whiskey, pretty much as high as it can get at 100% rye. Interestingly, though, and completely unexpectedly, the nose comes across almost fruity. It is undeniably a rye whiskey, but I also distinctly noticed apple and pear on the nose. Unfortunately, it also gave off a distinct nail polish aroma that was a bit of a turn-off. On the first sip, all I could say was "Wow!" In fact, sitting on my couch, watching Netflix, I actually exclaimed "Wow!" out loud. My wife wasn't sure what it meant, whether that was a good or a bad reaction. As I type this, I'm still not sure which it was. The "Wow!" was in reaction to how incredibly sweet this rye is. The sugary up front flavor was like dark corn syrup. Although the syrupy thickness wasn't there, the heavy, syrupy sweetness certainly was. Also immediately noteworthy was that despite this being a 100% rye whiskey, the spice was not anywhere near as strong as I had expected or even hoped for. In fact, it was a pretty mild rye in that sense. As off-putting as the initial syrup bomb was, once I got past that initial blast of sweetness, the whiskey had pretty good taste, smoothing out to a nice blend of apple, clove and brown sugar flavors that I found very enjoyable once they were uncovered. However, that was all somewhat offset by a mild but noticeable cherry cough syrup undertone. In the end, this whiskey required more work than I generally care to put in to get to the enjoyable part, and even then, what was enjoyable could not make up for what was not.